All type of urology products like Foley Balloon Catheter, Nelaton Catheter, Urethral Catheter, Male External Catheter, Urine Collecting Bag Pediatric Adhesive Type, Urine Collecting Bag With Measured Volume Meter (Urometer), Urine Collecting Bag with Hanger, Leg Bag for Urine Incontinence, Baby Bed wetting Alarm etc. 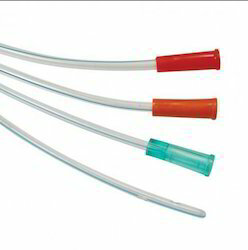 To meet the enormous requirement of clients, we are providing an excellent range of Foley Balloon Catheter. Our offered product is widely used for short or long term urine drainage. This is designed under the vigilance of our seasoned professionals using excellent grade material. Moreover, our precious customers can avail this in various sizes, shapes, designs and colors. This can also be customized as per client’s diverse needs at affordable prices. With the assistance of experienced and skilled professionals, we are engaged in offering a comprehensive range of Nelaton Catheter. This is available in diverse sizes and is used for bladder catheterisation through urethra. It is designed by making use of high grade raw materials with the aid of cutting-edge machines in accordance with set industry norms. Furthermore, this is made available for our prestigious clients at pocket friendly price. Nelaton Catheter are used for bladder cathterisation through urethra. 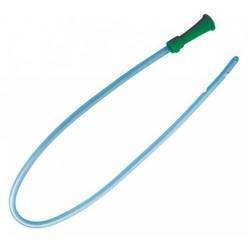 Catheter are made from Non toxic, non irritant, Medical grade PVC Compound. Radio opaque line provided through out the catheter for X-ray visualization. Distal end is coned with two lateral eyes for maximum drainage. 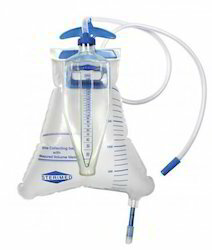 Proximal end is provided with Funnel shape connector for easy connection to Urine Bag. Funnel shape connectors are colour coded for identification of sizes. With the collective support of team and technology, we have become one of the foremost organizations of premium quality Urethral Catheter. Perfectly designed by our experts, this is manufactured by making use of quality tested materials with the help of cutting-edge machines. This offers complete relax to the patient and is highly demanded in nursing homes, and hospitals. In order to meet the various needs of clients, this is offered in different sizes at economical prices. Urethral Catheter are used for urine drainage. Catheter are made from non-toxic non irritant medical grade PVC Compound. 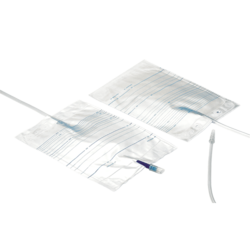 Proximal end is provided with Funnel shape connecter for easy connection to Urine Bag. Our firm engaged in providing hassle free hospital products to our clients, engaged in providing high grade Male External Catheter. Manufactured by utilizing exceptional quality materials under the guidance of our skilled experts in sync with standardized norms, this is available in diverse sizes. This is used by men during drainage of toilet. Our offered can be purchased from us in diverse specifications at market leading price. 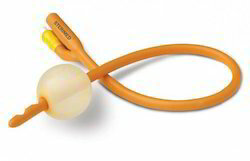 Male External Catheter are used for urine incontinence in Male patients. Provided with adhesive strip for proper fixing of catheter. Urine Collecting Bag Paediatric is used for urine collection for both Male and Female infants. 100ml Urine Bag consist of Hypo allergic adhesive for proper fixing of urine bag. Urine Bag is graduated with easy to read scale. 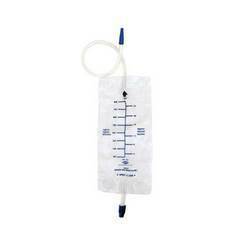 Urine Collecting Bag with measured volume meter is used for measurement of urine output. 2000ml Urine Bag is manufactured from extra strong sheeting to withstand during the long period. 250 ml Capacity measured Bottle provides accurate measurement of urine output. Urine Bottle is directly connected to the Urine Bag as to avoids any possibility of contamination. Push/Pull type Bottom outlet facilitates convenient emptying of Urine Bag. 90cm kink resistance tube provided with Universal connector. Urine Collecting Bag is used for short and long term urine drainage. 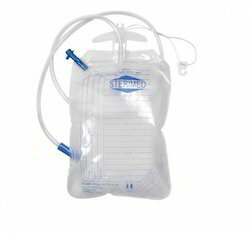 2000ml Urine Bag is manufactured from Medical grade soft PVC sheeting. Universal Connecto for easy connection to the drainage catheter. Bag is graduated with easy to read scale. Also available with Top Bottom Outlet and Moulded handle for easy handling and carrying facility. Closed urine drainage system for short as well as long term use. Reinforced eyelets allow easy hanging and provide maximum protection against tearing. Push/Pull type bottom outlet allows convenient emptying. Kink resistant 90cm tube provided with universal tapered connector.